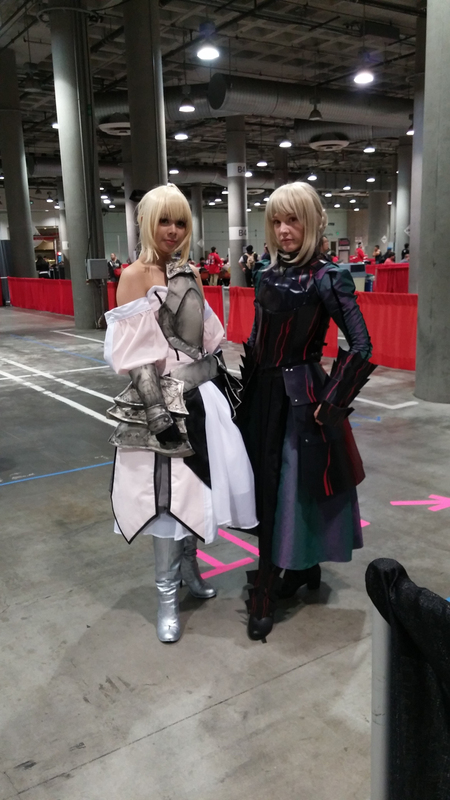 Anime Expo 2015 started as quickly as it ended…Did any of you have fun? Because I sure did! 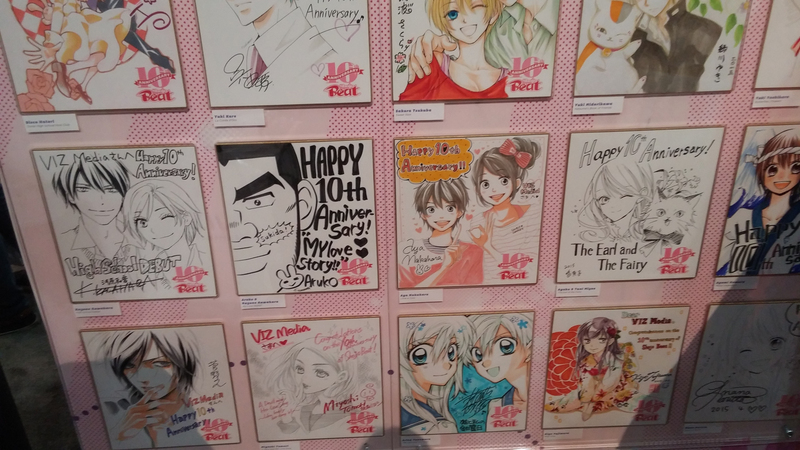 This year, Anime Expo had tons of events and guests lined up, so my days there were really busy with very little rest. But I managed to get most of everything I wanted done, so it was a massive success! This entry will focus on what we did from day 0 to day 2, complete with lots of pictures! 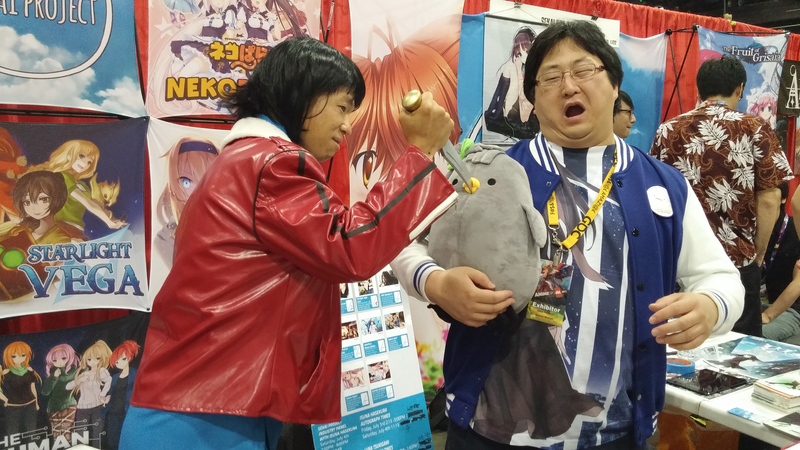 Let’s take a close look at what adventures we had at Anime Expo. We had an early flight and got to LA with lots of time to relax and explore the area. View from our hotel window! 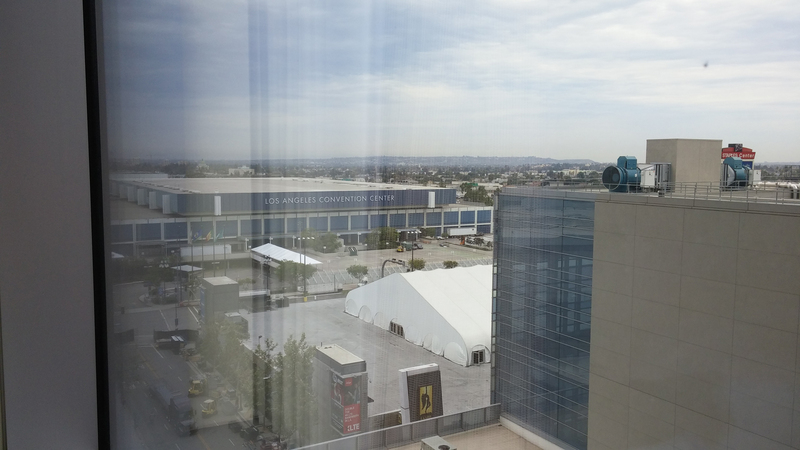 I see you LACC! After checking in at the hotel, we decided to go to Little Tokyo to have lunch and do a bit of shopping. 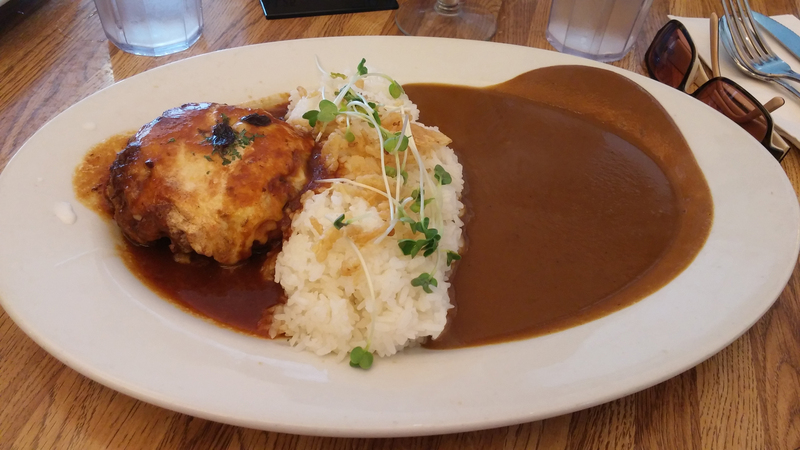 For lunch, we went to Curry House, as per our Anime Expo tradition! Beef and Pork Juicy Burger Curry! 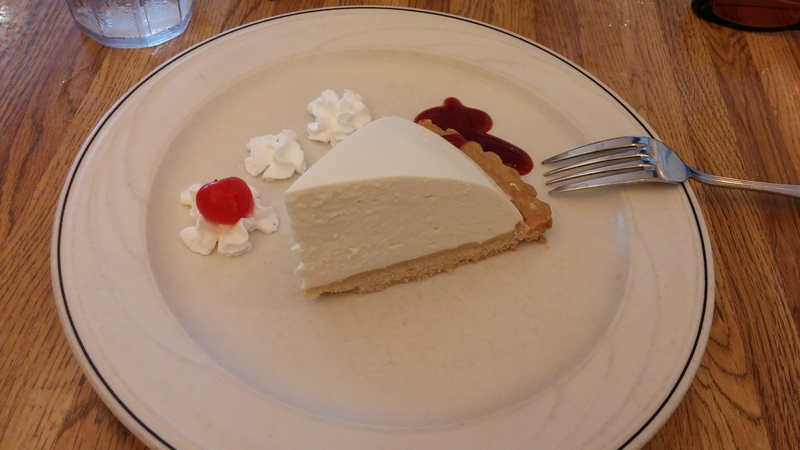 If you’re ever in Curry House, please try their Tofu cheesecake. It’s SO GOOD that I have to have one each time I’m in the area! Their deluxe curry dishes are truly amazing. It really makes me wish there was a restaurant like this where I live! Since it was next-door to Curry House, we stopped by Kinokuniya to do a bit of shopping. 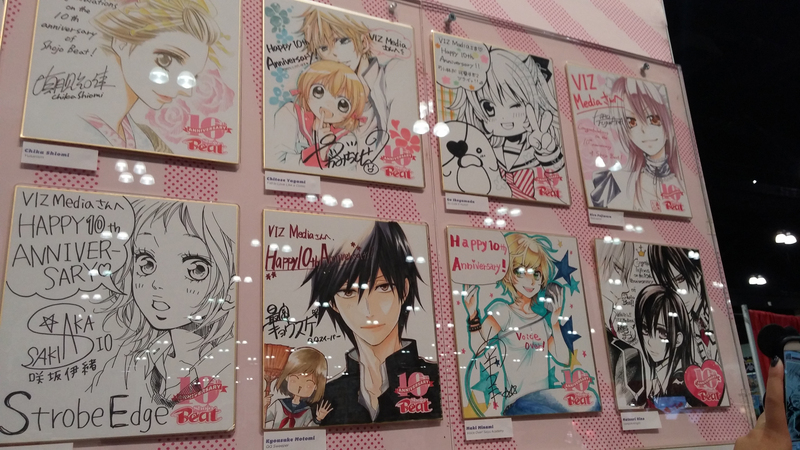 Kinokuniya had a booth at Anime Expo’s Exhibit Hall, but there are some interesting goodies that they don’t bring with them to the convention. 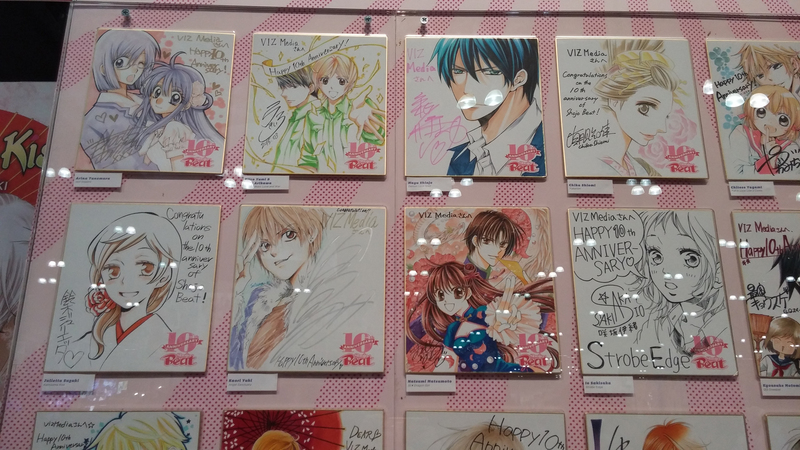 For instance, they don’t tend to bring a whole lot of manga with them to the convention; they mostly focus on art books from current popular series and a selection of music CDs. Since their booth was shared with Animate, it had a lot more items like dakimakuras, cosplay sets from COSPA, and doujin goods. I ended up picking up a lot more books at Kinokuniya than I thought! 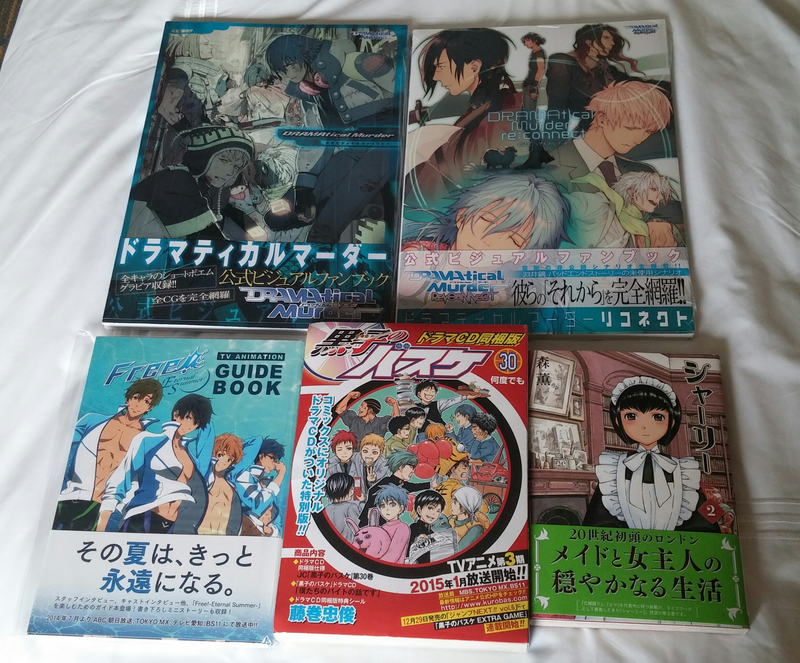 They had the DRAMAtical Murder Official Visual Cool-B Collection Fanbook and the DRAMAtical Murder: Reconnect Official Visual Cool-B Collection Fanbook, and since I’ve been on a DRAMAtical Murder kick lately, I had to pick those up! They’re gorgeous books containing the CGs of the games along with lots of promotional art used in magazines. 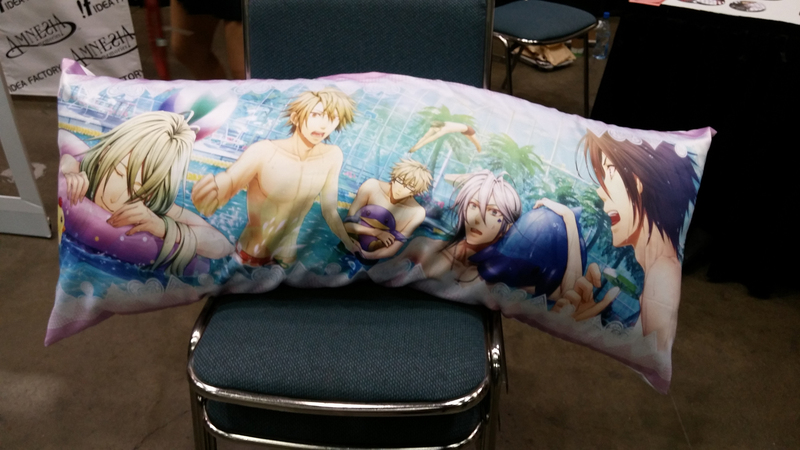 I also picked up the Free! Eternal Summer TV Animation Guidebook, which has staff and cast interviews along with a mini story and illustrations. Along with that, there was this lone Kuroko no Basket limited edition set of the last manga volume that comes with a drama CD and a sticker set that I couldn’t resist picking up! And lastly…Shirley volume 2?! I always thought there was only one volume since it’s the only one that CMX Manga brought over. Here’s to hoping that Yen Press releases Shirley in the same way they’ve been releasing Emma! AX banner on the way to pick up badges! Afterwards, we headed towards the convention center to get badges picked up, hoping that the same catastrophe that happened last year wouldn’t happen a second time around. 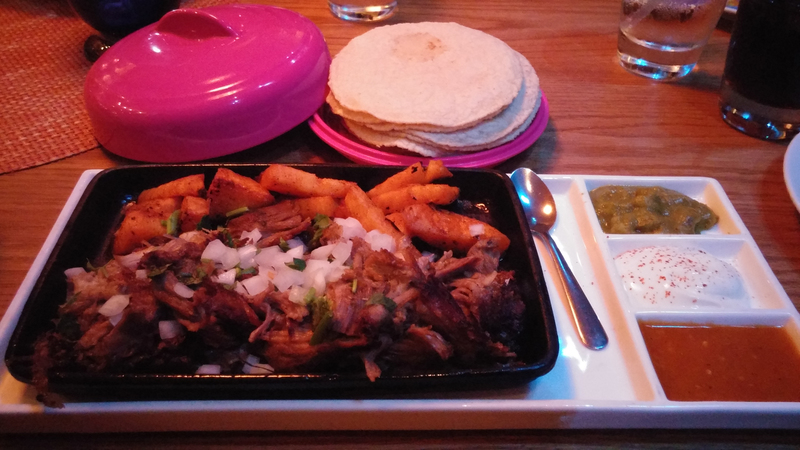 We were pleasantly surprised! Badge pick-up was incredibly fast and smooth. It took us a minute to get everyone’s badges! Seems like Anime Expo’s switch to Eventbrite was a good choice in aiding with all the badge issues that happened last year. The only minus is that we couldn’t pick up concert tickets until much later than it was previously announced. Even though badge pick-up was really fast, Anime Expo still needs work with handling their main events. If enough feedback is given, perhaps they will work out the quirks for next year’s convention. 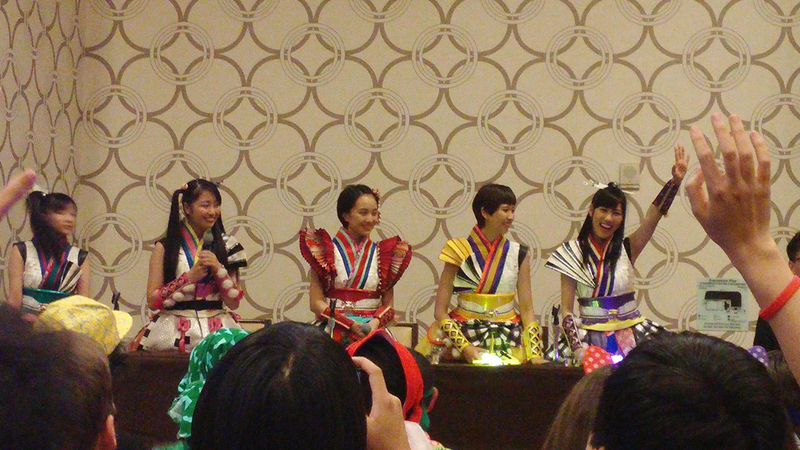 Next on our schedule was the Momoiro Clover Z Fan Event being held at the JW Marriot hotel! 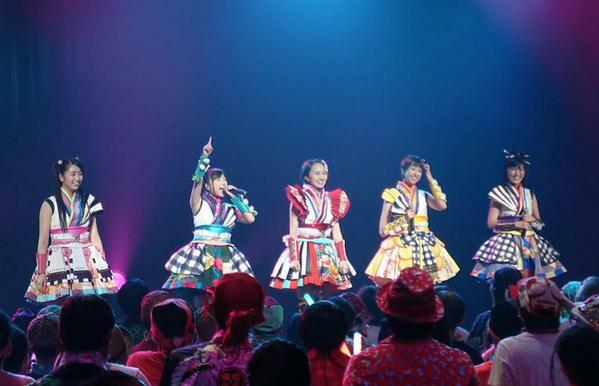 The event was supposed to be a concert DVD viewing event to get new fans acclimated to otagei, so fans can follow along in the actual concert. We didn’t get to do much of the DVD viewing, and after doing their respective otagei, they switched gears to have this fun talk session with their fans! It was a real treat, and it was really enjoyable watching their reaction along with the crowd’s reaction. There was even a chance to win signed DVDs and BDs if anyone won a game of rock-paper-scissors against them! There was plenty of interaction with fans, which wasn’t something that anyone expected. When the event was over, the crowd got to actually greet them before they exited the room, which was pretty neat! 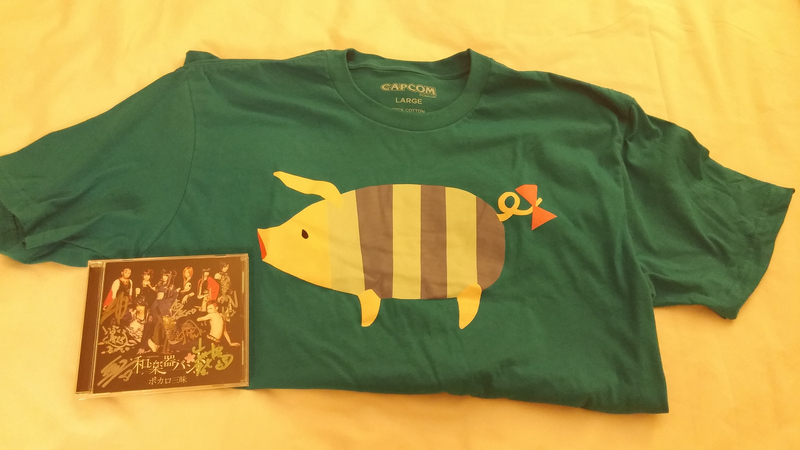 Some goods from the Momoiro Clover Z event! 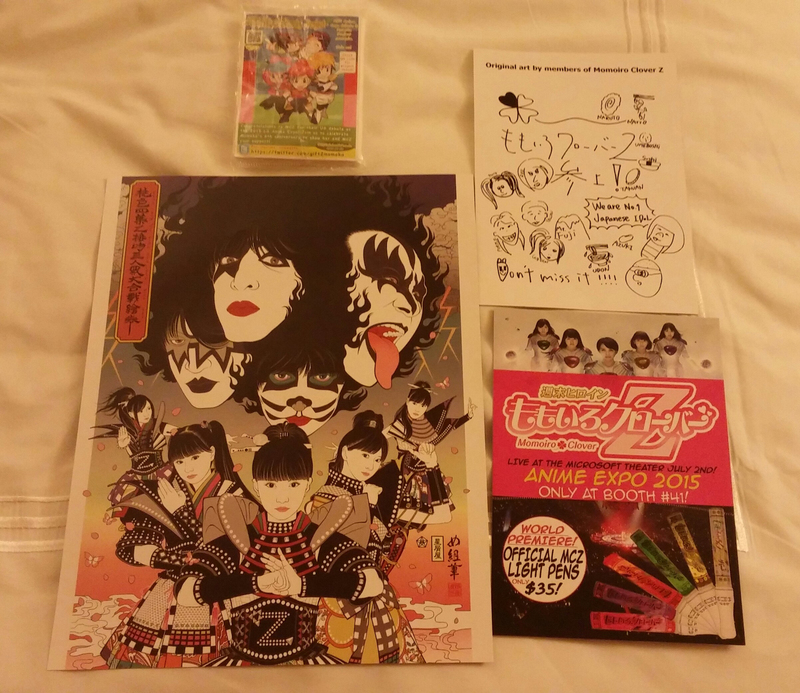 Along with getting a sales menu of what they’ll have at their booth, we got a nice Momoiro Clover Z x Kiss illustration and a little printed card with their signatures and their interesting-looking art. The tissue pack that was passed around had a QR code for fans to take part in a special event online! It was a pretty enjoyable event to have the night before the actual convention started. Perhaps Anime Expo will keep having these day 0 events in the future? 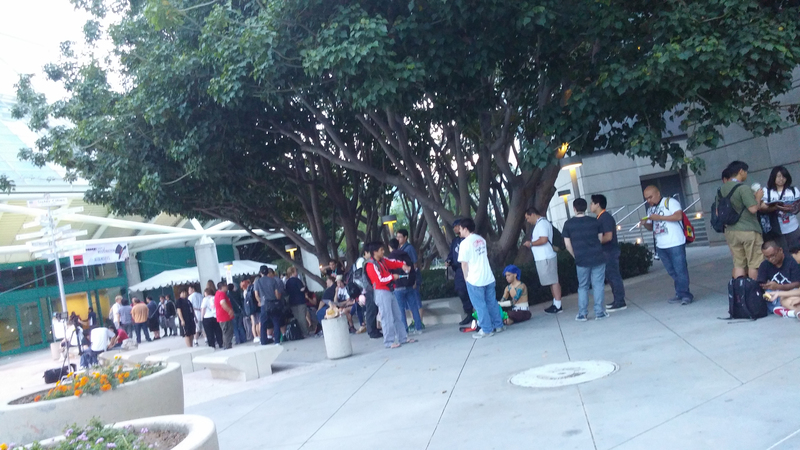 Day 1 autograph ticket line! Due to wanting to get several autographs, most of our days began with waking up really early to line up at the autograph ticket line. We got up reasonably early, but there was already quite the line by the time we got there! Of course, as time went by, the line kept getting longer and longer, until it wrapped around the building! Anime Expo did autograph tickets differently this year: attendees must choose one autograph session ticket, and if attendees want another different session for the same day, they’d have to line up all over again to get the other ticket. While it sounds tedious, it gives more of a chance to others to get the autograph of the person they want to see the most. 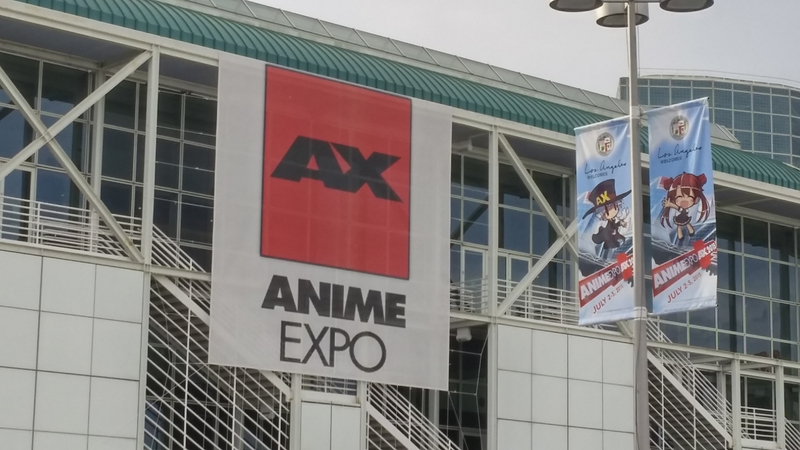 The only exception to that rule were the tickets that were acquired if attendees spent over a certain amount at a select booth, or sessions held apart from what was listed on Anime Expo’s site. Luckily for us, everyone we wanted to see were spaced out in the following 3 days, so we could get them all! While waiting in the autograph ticket line, we caught a glimpse of the gorgeous Shall We Date? bus! 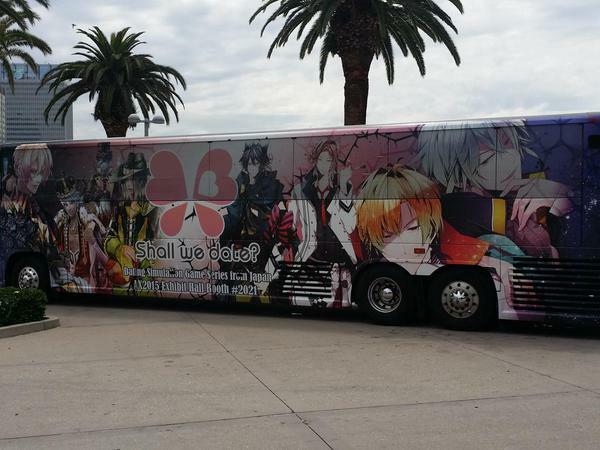 Closer look at the bus! Photo credit: Yaoicon on Twitter. 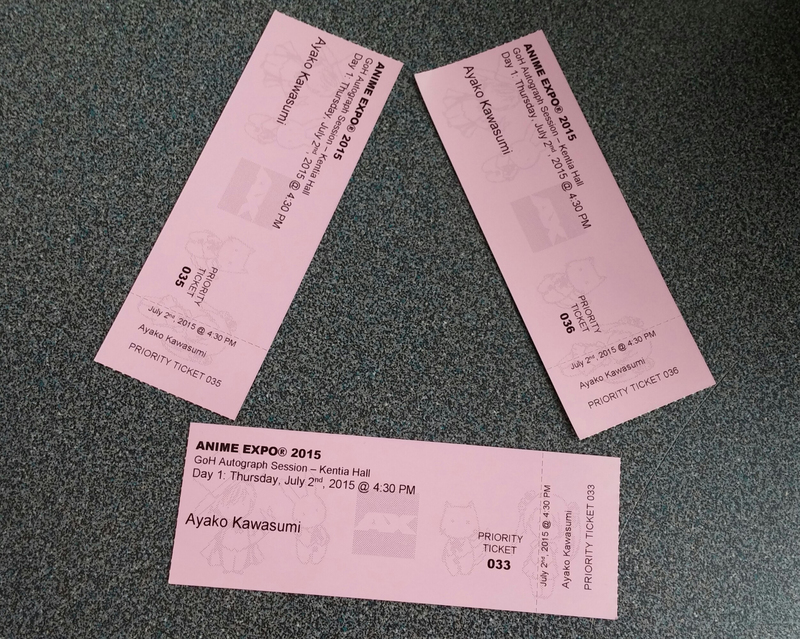 Our group was successful, and we all scored priority autograph tickets to Ayako Kawasumi’s autograph session! After celebrating our success, I went to check out the premier fan lounge, which was full at the time with people getting their premier benefits redeemed and lanyards picked up. 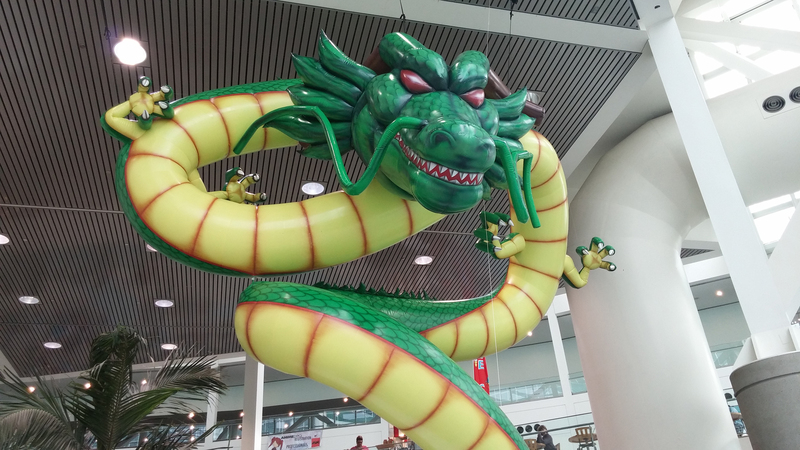 On my way to the premier fan lounge, I saw this impressive Shenron display! I went onward to wait in the line to get into the Exhibit Hall, which was already pretty long. While the line was slowly moving inside, I had to make a choice: line up for the Goodsmile Company booth or the Atlus booth. 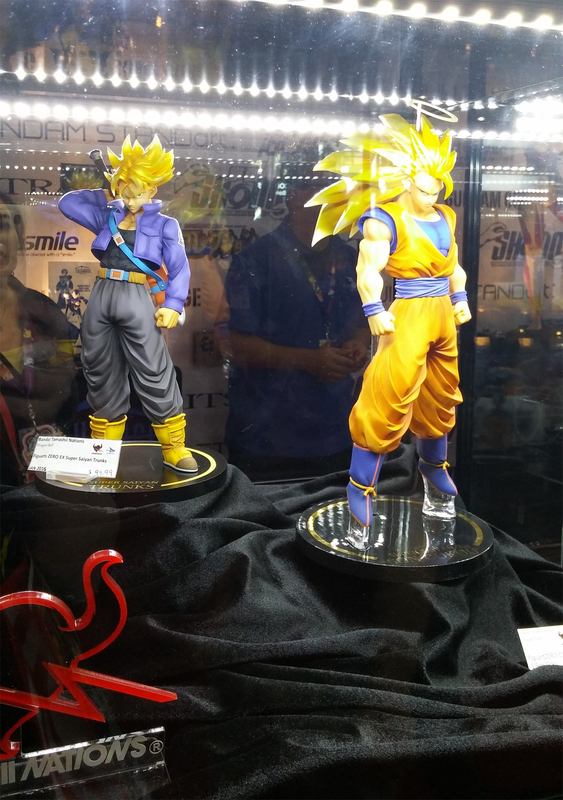 By the time I got in the Exhibit Hall, the Goodsmile Company booth line was ridiculously long and about to be capped. Luckily, Kenji was in the Goodsmile Company line already, so I just gave him my cash and a list of what I wanted him to pick up for me. Then I made my way to the Atlus booth line which was quickly growing. I basically got there at the perfect time; the line was extending towards the wall of the Exhibit Hall! 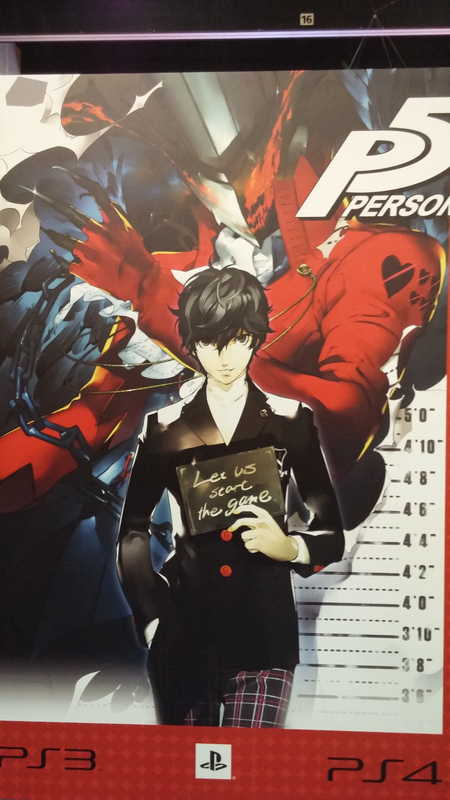 Persona 5 display at the Atlus booth! 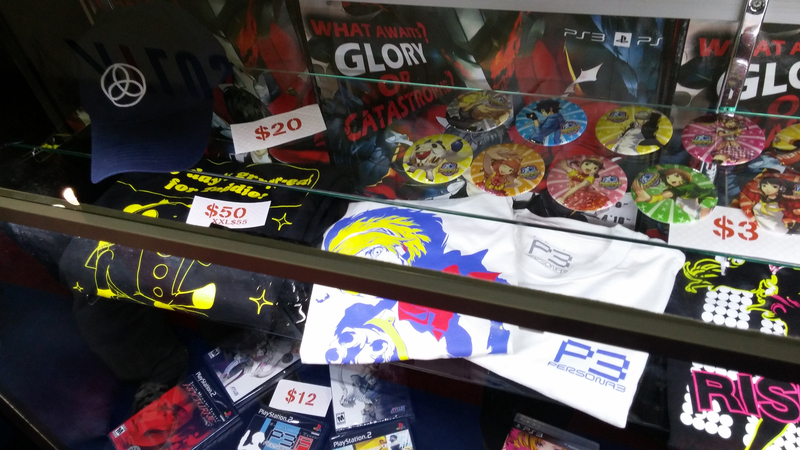 Atlus had a Persona 5 display with the trailer of the game playing on one side, and the Persona 4: Dancing All Night demo for people to play with on the other side. No light-up floor with dancing Teddie though. 😦 I was looking forward to dancing with Teddie! 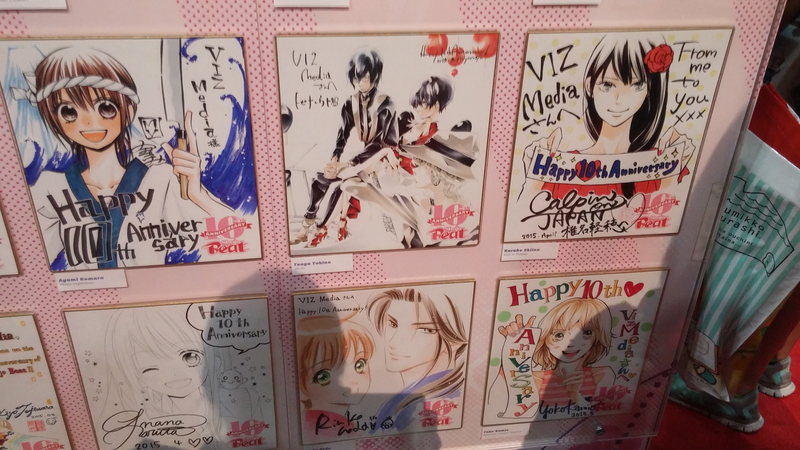 The booth employees were handing out surveys for attendees to get a clearfile and postcard set. The questions centered on what fans would like to see them do: concerts and musicals in select cities, whether they should go to other conventions and what they should bring to those events. It’d be nice if we actually got some concerts that we can go to! Fingers crossed! 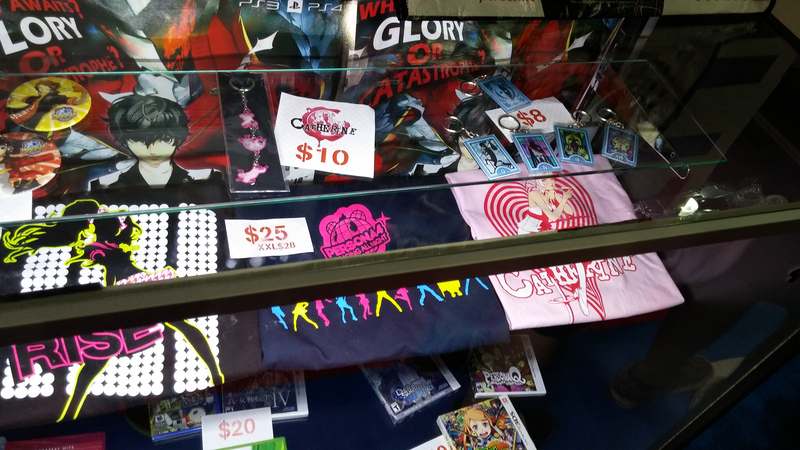 Once I got my Atlus and Goodsmile Company goodies, I ventured off to other booths! 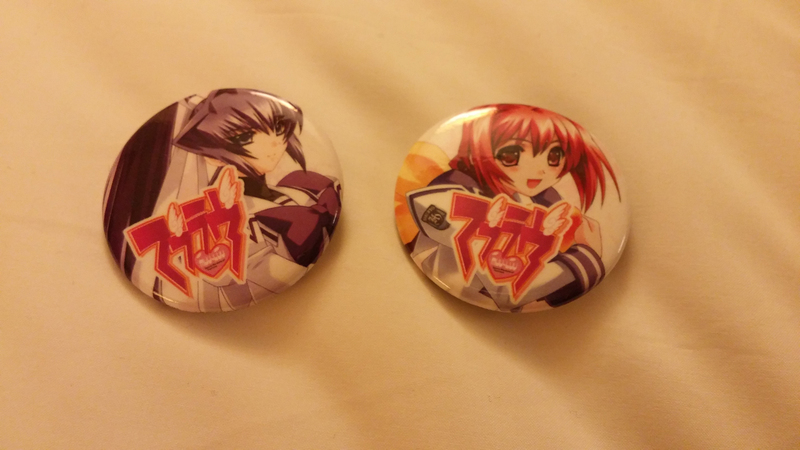 Over at Degica’s booth, they were promoting their upcoming kickstarter for the Muv-Luv games with free pins, and sketches that you could purchase. They had other goodies to purchase like mobile straps and art books! 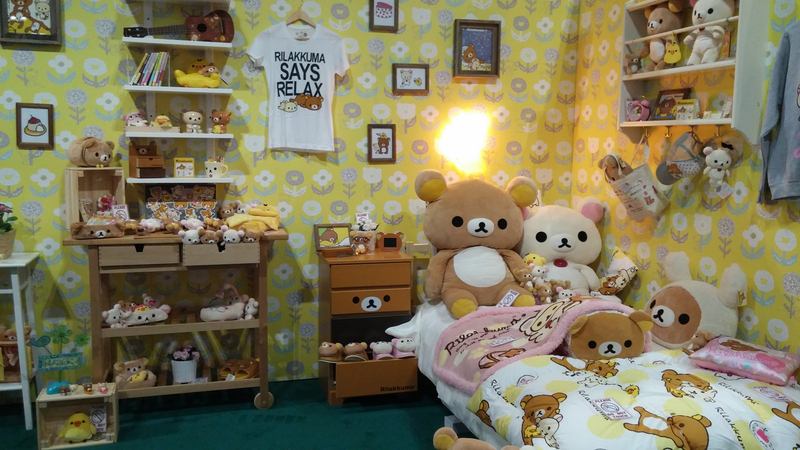 Insanely cute Rilakkuma room display! 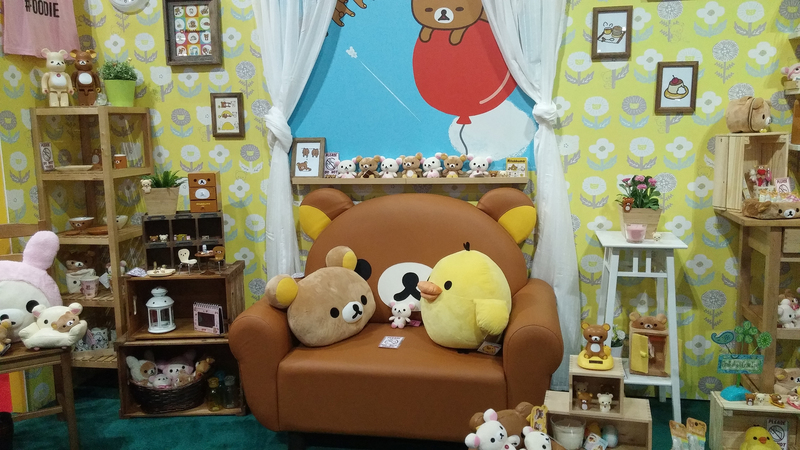 I want that Rilakkuma couch! The Rilakkuma booth was completely ADORABLE! On one side, they had this room display full of Rilakkuma items. I won’t lie…I really wanted to sit in that very cute couch! On the other side was the actual booth shop. I got the exclusive Rilakkuma backpack! And on one other side of the booth, they had a stage set up so Rilakkuma could come out and greet attendees. It was the cutest booth setup I’ve ever seen! I caught myself constantly going back there and looking at the room display. 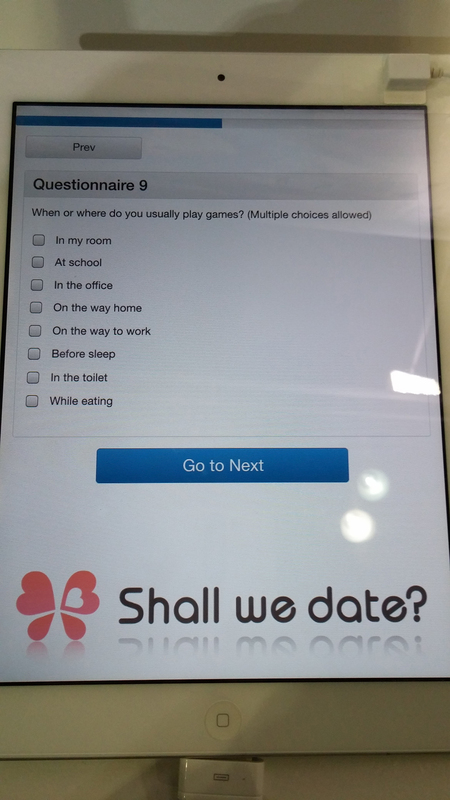 The Shall We Date? booth was massive this year! It had several photo areas for attendees to have their picture taken with standees or display banners. 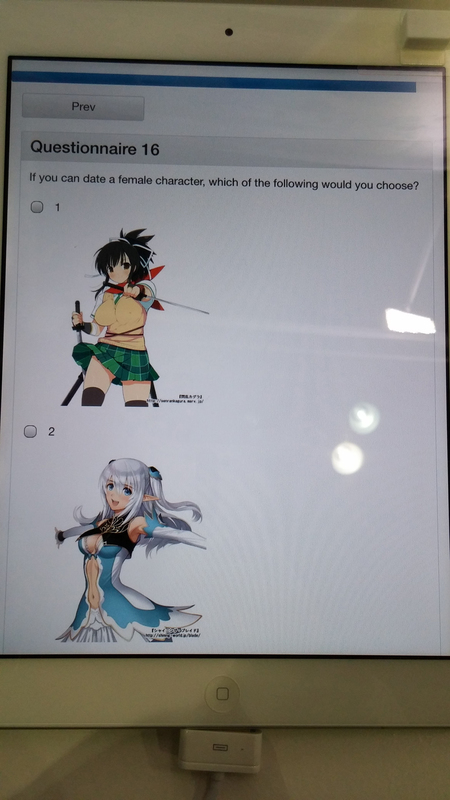 They had a survey that attendees could take in exchange for a pin of one of their titles. 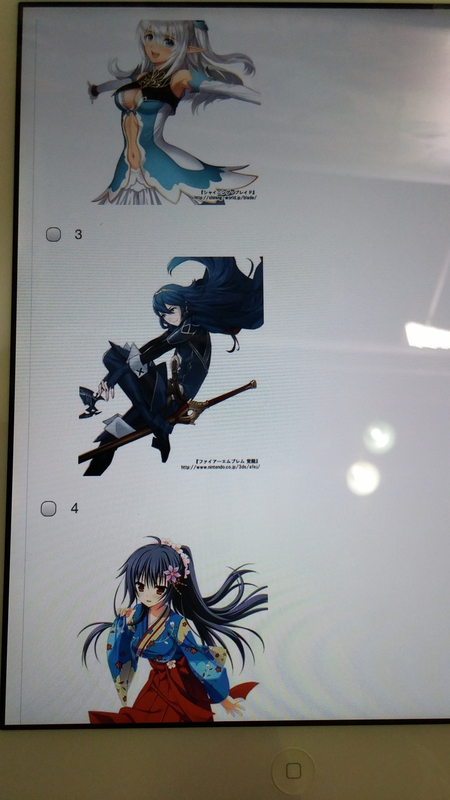 Yup, that’s Lucina in option #4! 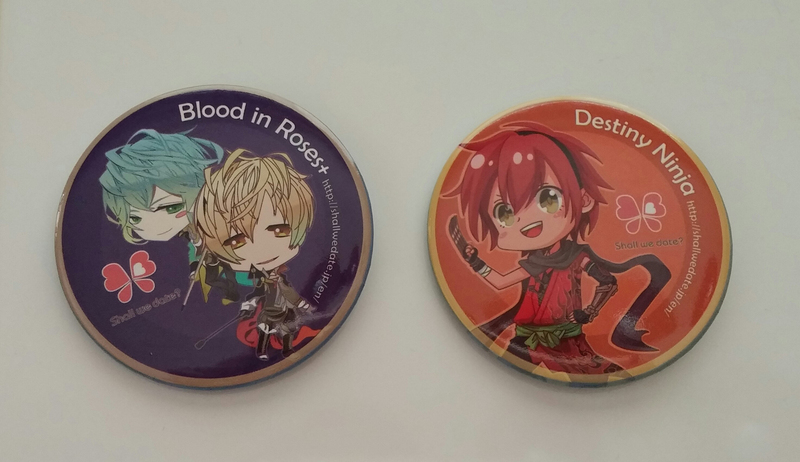 Pins offered at the booth! 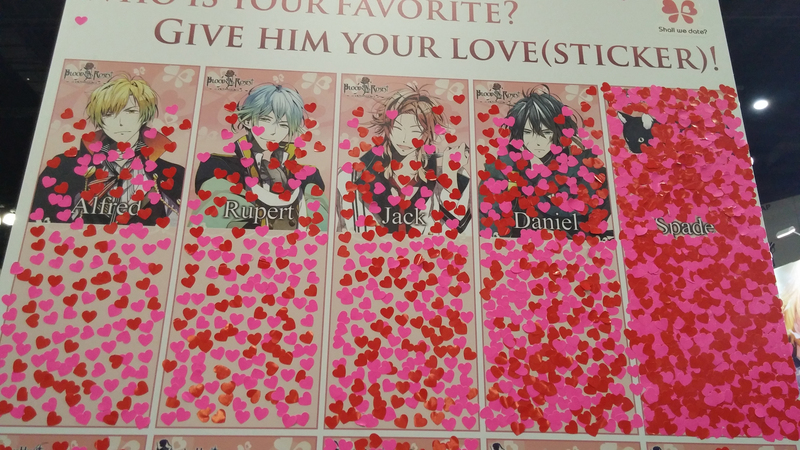 At the other side of their booth, they had a poll that attendees could take part in: give your favorite guy a love sticker. I waited until the last day to take a picture of the results…and some of the results were hilarious! Look at all those hearts for Spade! 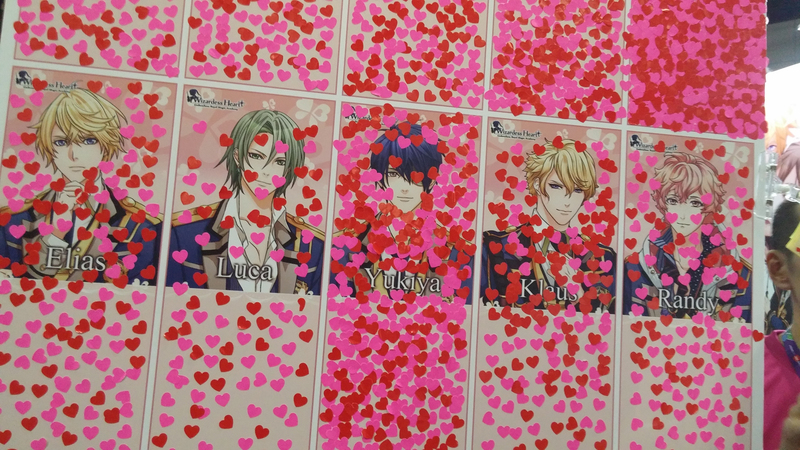 Yukiya seems the most popular in Wizardess Heart! Oh my…all the Skeletiano hearts! 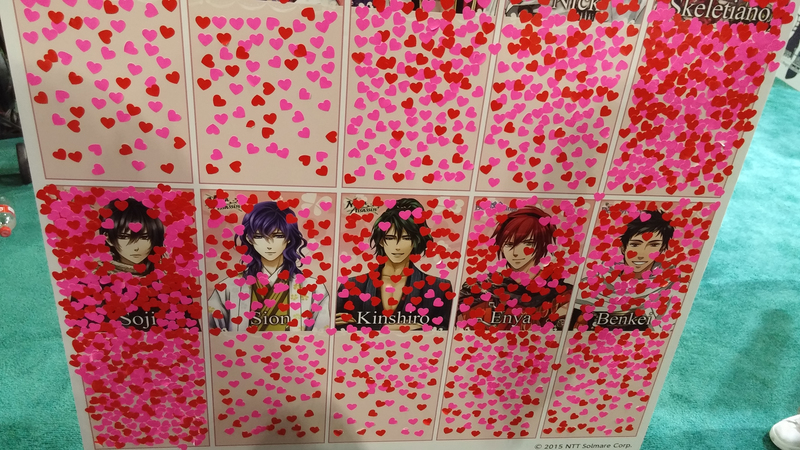 And of course, Soji is the most popular in Ninja Assassin! 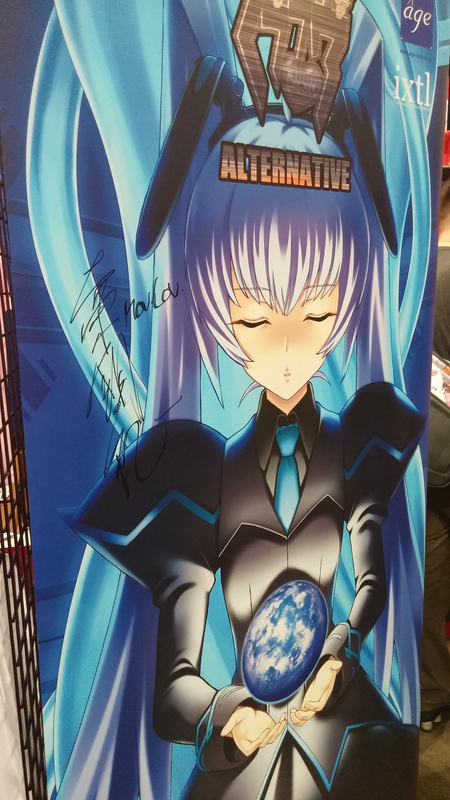 After wandering in the Exhibit Hall for a few hours, I met up with my friends and headed over to Ayako Kawasumi’s scheduled autograph session. 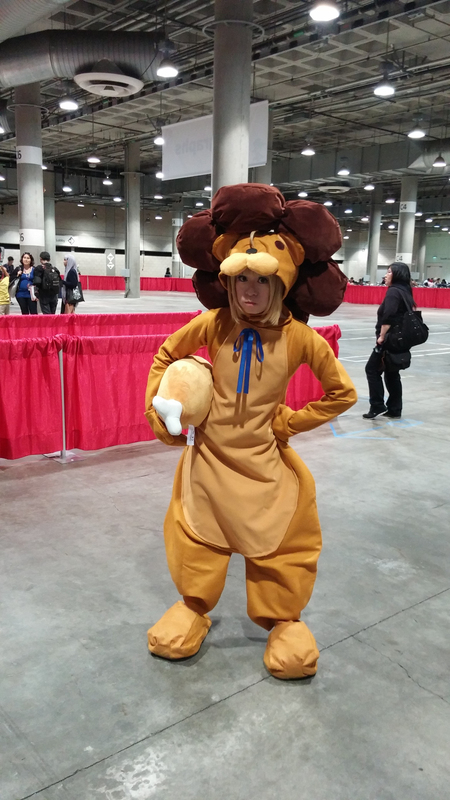 Adorable Saber Lion at the Kawasumi autograph line! 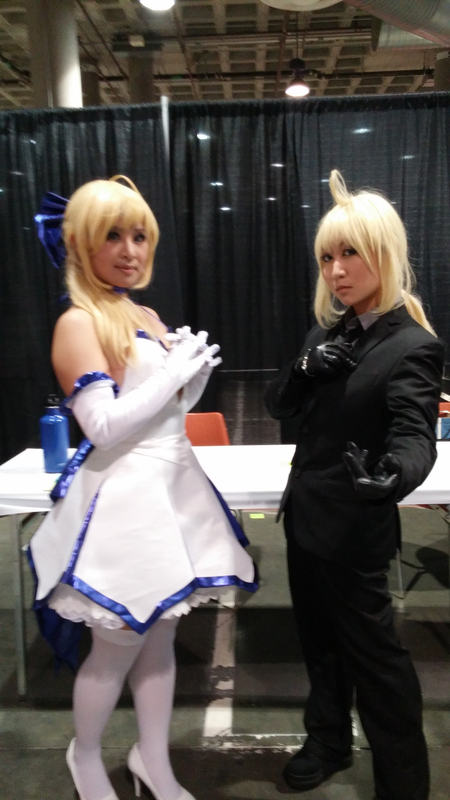 Saber Lily and Saber Alter at the Kawasumi autograph line! 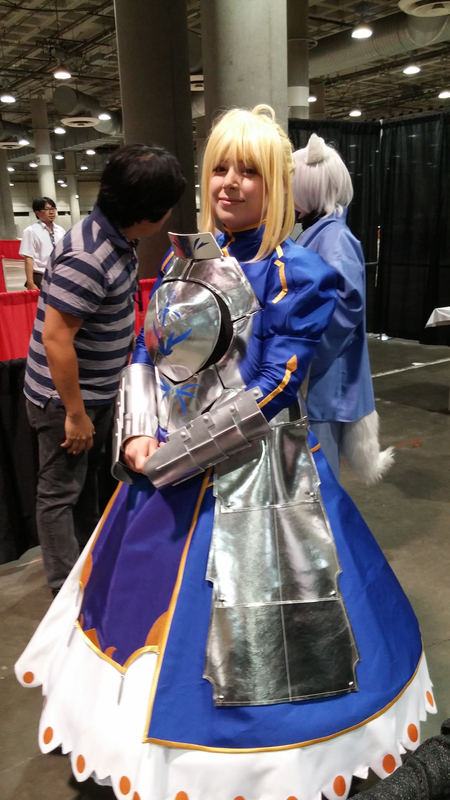 Saber greeting us before we get our stuff signed! Kawasumi’s autograph along with other autographs on my Fate/Zero box! I never thought my Fate/Zero box would have all of these autographs on it! It’s been several years of work to get all of them. 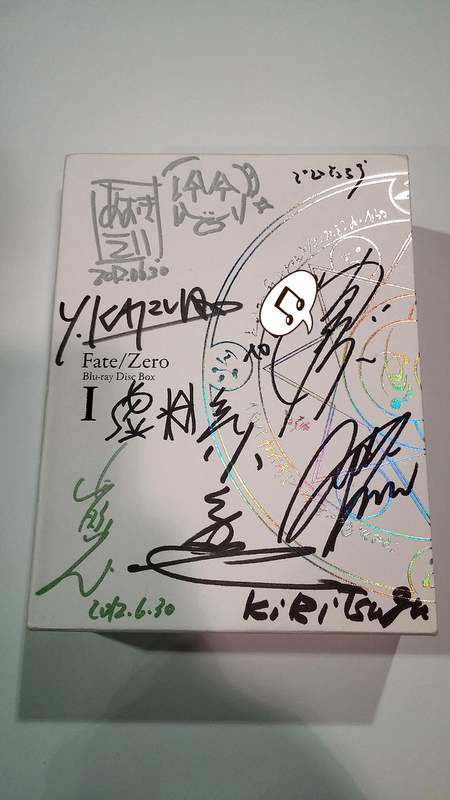 The autographs on the box thus far: Gen Urobuchi (writer of Fate/Zero), Takaki Kosaka (Nitro+ president), Ei Aoki (director of Fate/Zero), Hikaru Kondo (founder of Ufotable), Yuki Kajiura (composer of Fate/Zero music), Rikiya Koyama (voice of Kiritsugu), Seki Tomokazu (voice of Gilgamesh) and finally…Ayako Kawasumi (voice of Saber). 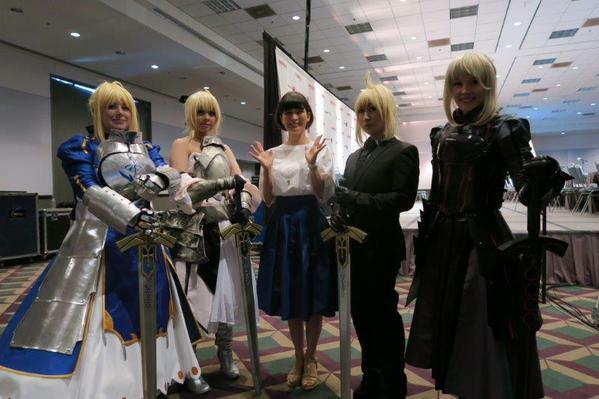 Saber cosplayers with Ayako Kawasumi! 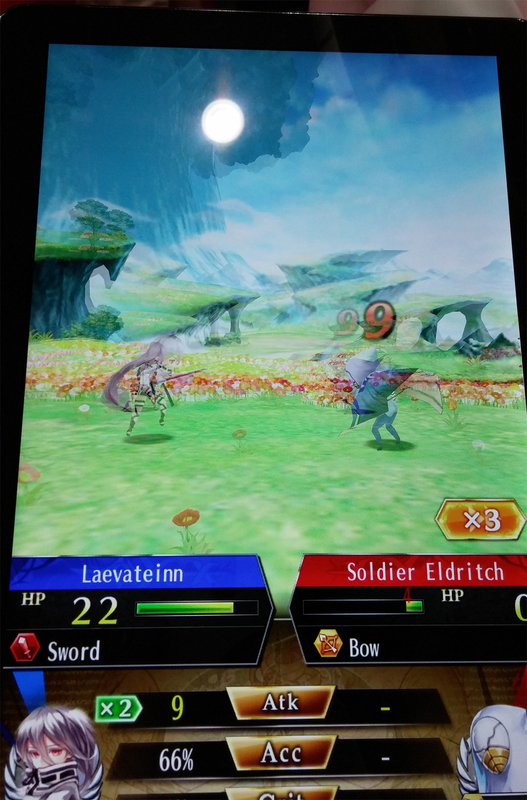 Photo credit: Hikaru Kondo on Twitter. 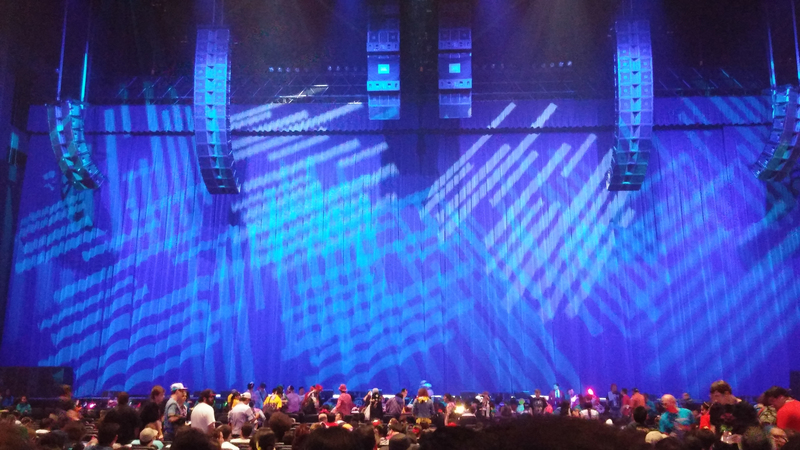 Afterwards, it was time to get ready for the Momoiro Clover Z concert! 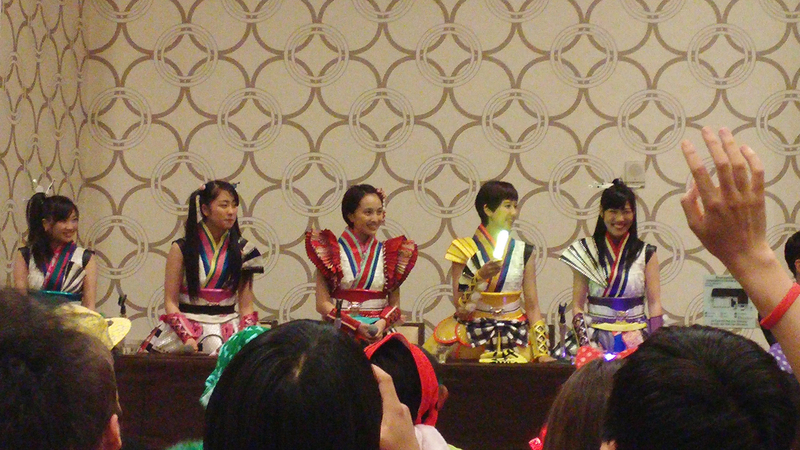 We got a pretty good view of the Momoiro Clover Z concert! It was such a high-energy show! Photo credit: Momoclozamurai on Twitter. So many colorful lights! 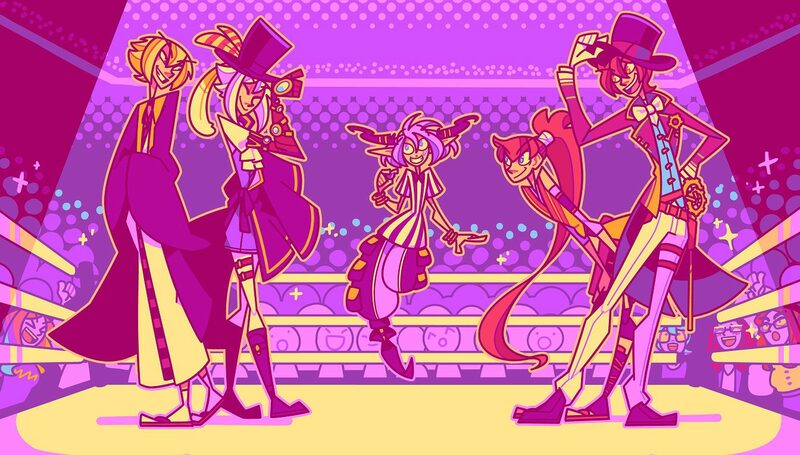 Photo credit: Momoclozamurai on Twitter. I was impressed by how many different choreographies they memorized, not to mention how much they danced and moved around! These girls are seriously talented and it showed in their concert! I was a bit let down, because I thought some Kiss members would be performing alongside them for one song, but they just made an appearance. 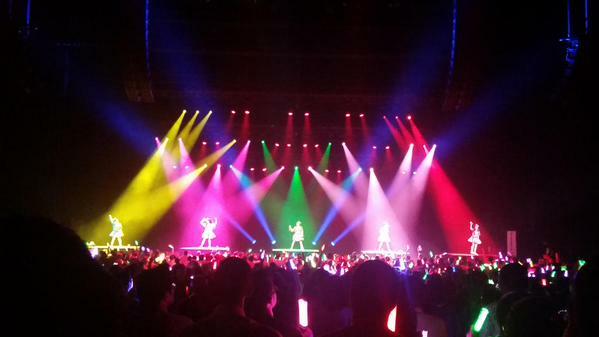 Either way, it was a good concert to end our first day at Anime Expo! 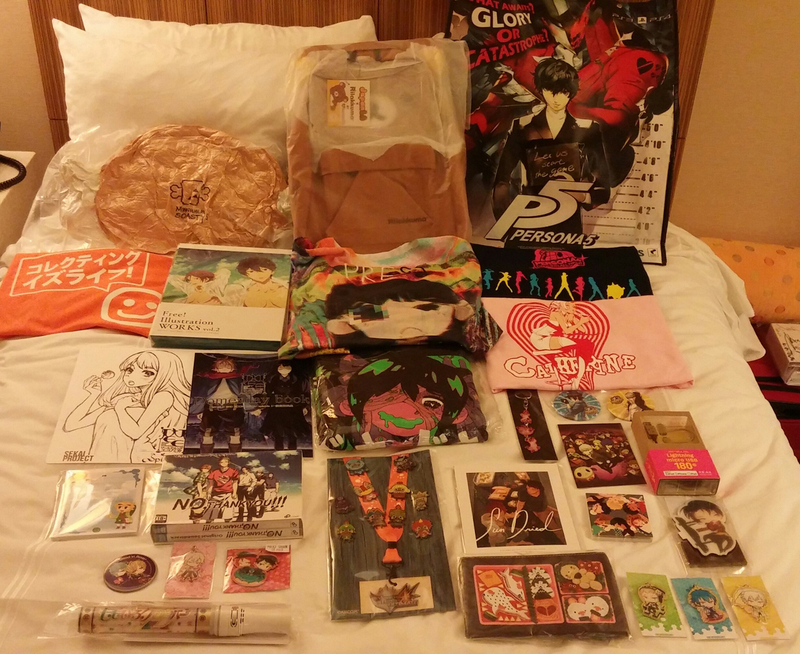 Got plenty of goods in the first day! Lots of exclusives from the Atlus, Kyoto Animation, Capcom, Sekai Project, MangaGamer, Rilakkuma and Goodsmile Company booths! Also picked up some stuff from the Omocat and cheero booths, along with some goods from my favorite artists in the Artist Alley. Once again, our day began with us waking up really early in order to line up for the autograph ticket line. Wagakki Band autograph ticket GET!! 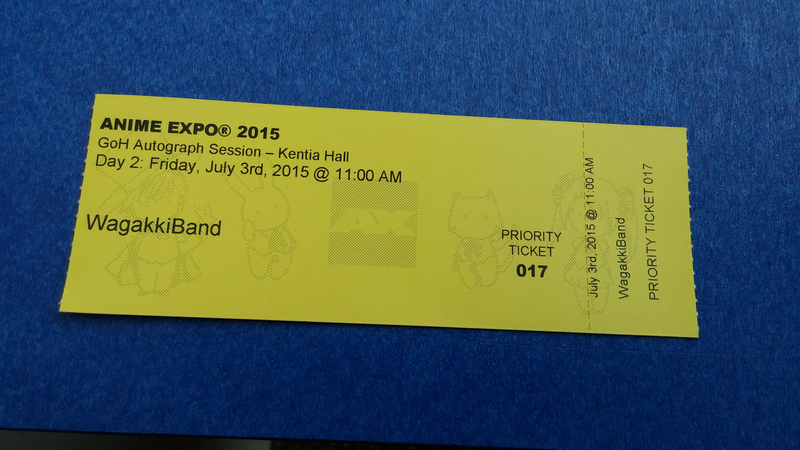 Waking up early was worth it, since I got another priority autograph ticket, this time for Wagakki Band’s session! Since we didn’t get to purchase Wagakki Band’s album the previous day, we raced in the Exhibit Hall to purchase one, and then run all the way back to Kentia Hall in time for the autograph session. Phew! 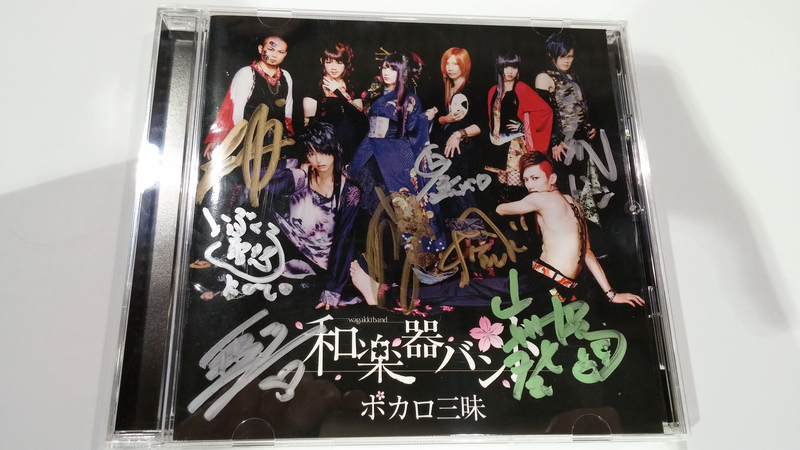 Got Wagakki Band’s Vocalo Zanmai album signed! The Wagakki Band members were really nice, and tried their best to talk to their fans in English! 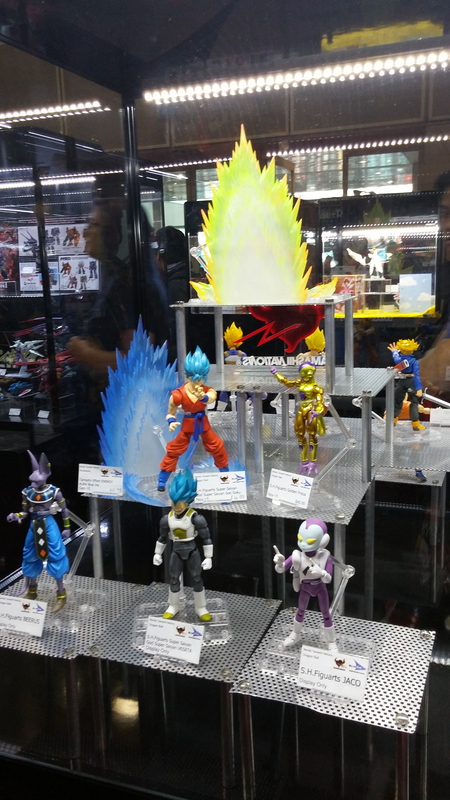 After the autograph session, we ventured into the Exhibit Hall once more, to have a look at what we missed on the previous day. Phantom of the Kill banner! 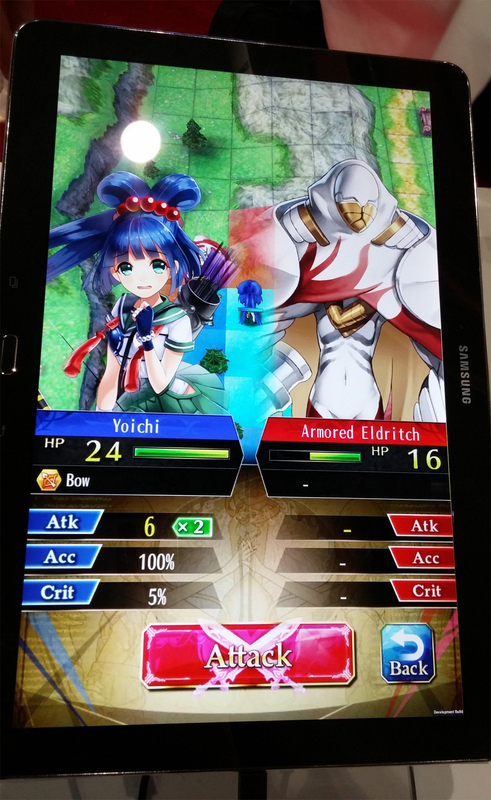 I stopped by Gumi’s booth to try out their new game, Phantom of the Kill, a strategy mobile game. If attendees tried out the game and answered a quick survey on it, they got a neat and roomy Gumi bag that shows off their titles that have been released so far. 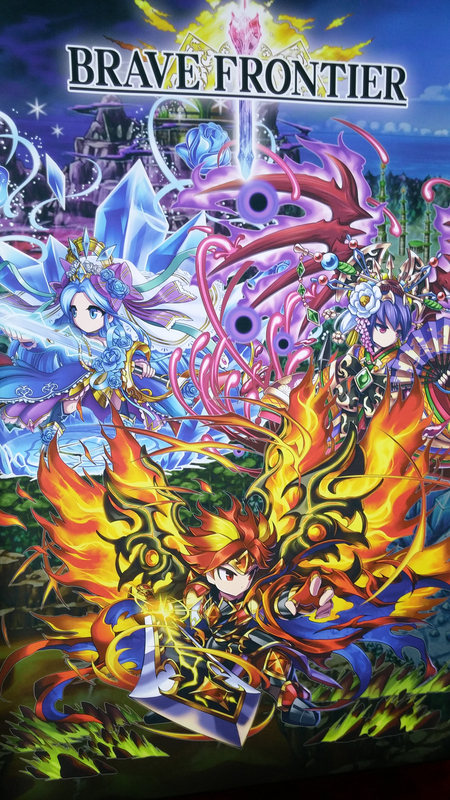 Also, if attendees play Brave Frontier, they got a card with a code for a sphere for them to use in-game! Phantom of the Kill is very Fire Emblem-esque. 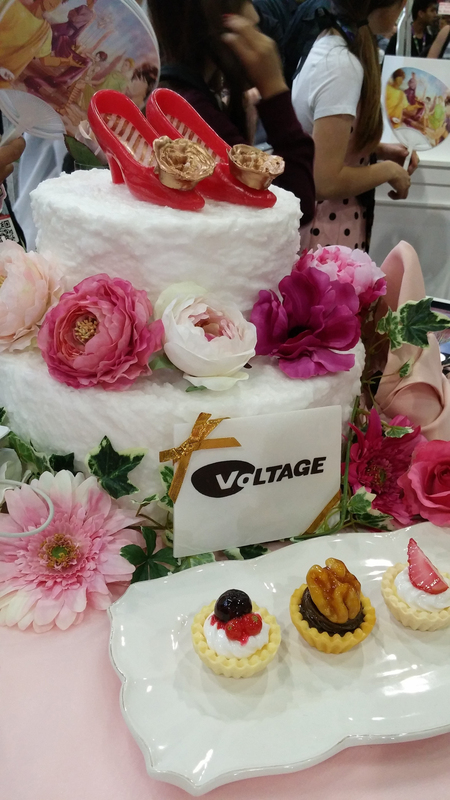 Next, I stopped by Voltage’s booth, which had this intricate wedding theme display! 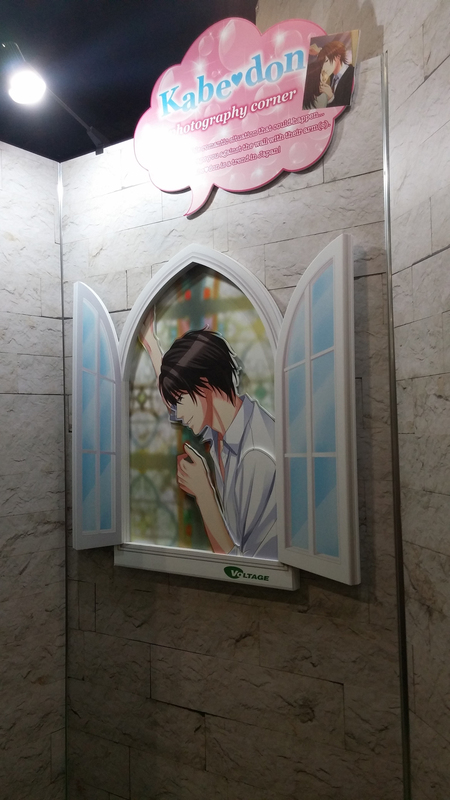 One side of their booth was built to look like a chapel, for attendees to take a picture with Voltage’s cosplayers! 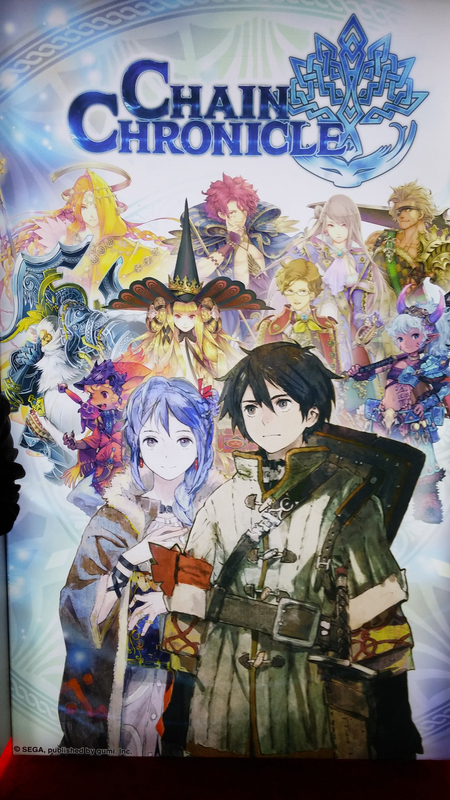 There was another display which attendees could get their picture taken with the character displayed. Attendees could get their pictures taken with the display! 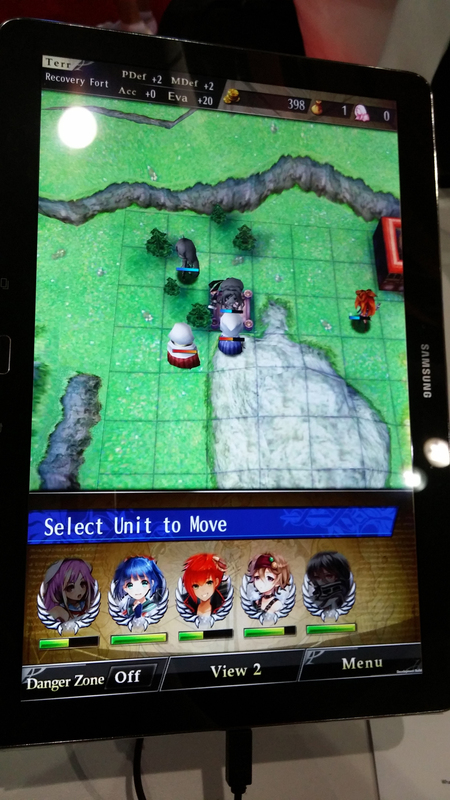 Voltage was promoting their new game, Labyrinth of Astoria. They had a sign-up bonus with an exclusive in-game item you could only get if you signed up at their booth! Promoting their new game: Labyrinth of Astoria! They also had a shop at their booth that sold a bunch of goodies, but by the time I got to it, most of the items were already sold out. 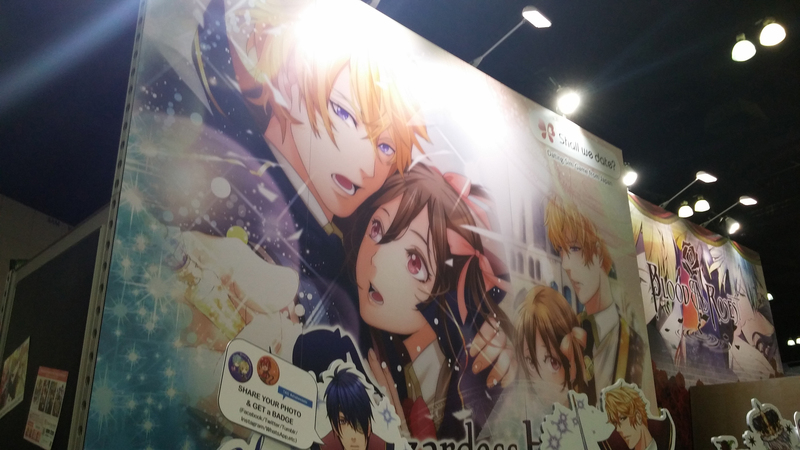 Aksys had their Code: Realize banner out on display! 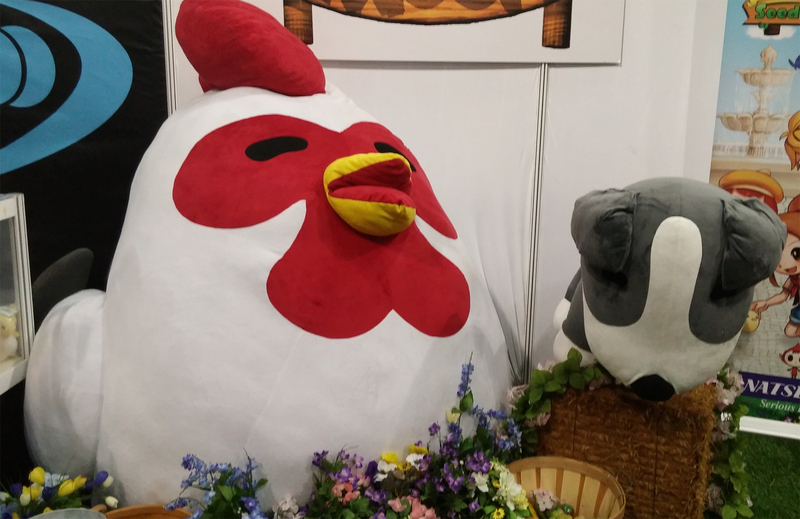 Chicken’s all like “awww yeeeeaaa” at the Natsume booth! 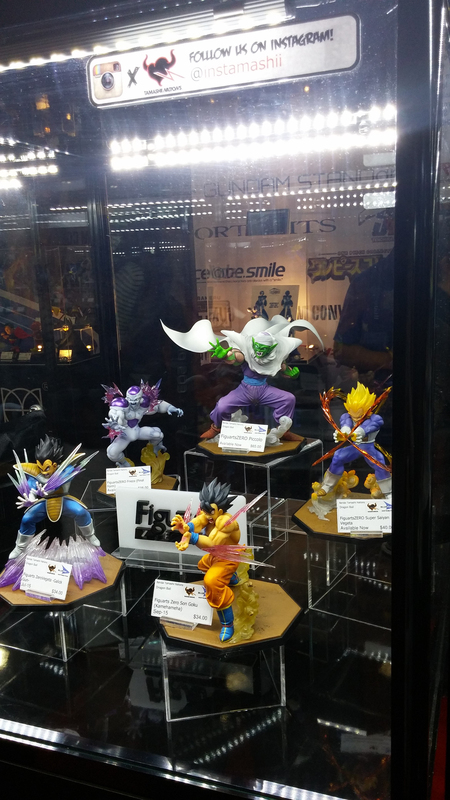 The Bluefin booth had some great figure displays featuring characters from Cardcaptor Sakura, Dragon Ball Z, Sailor Moon, Super Mario Bros., and many others. 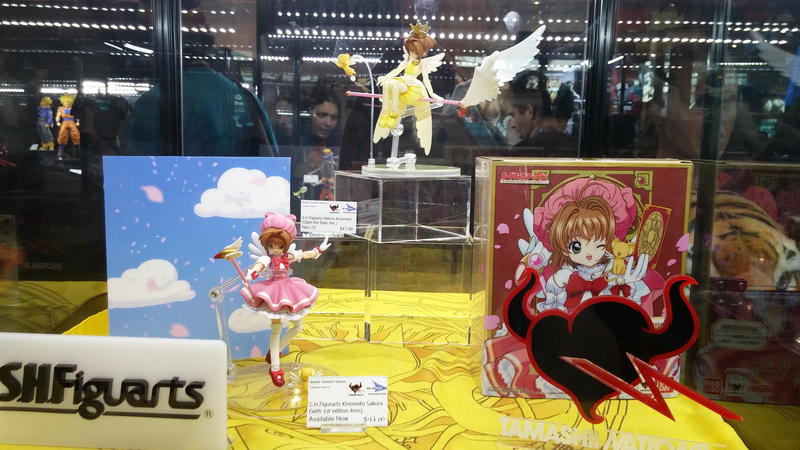 Cardcaptor Sakura SH Figuarts display! Super Mario Bros. SH Figuarts display! 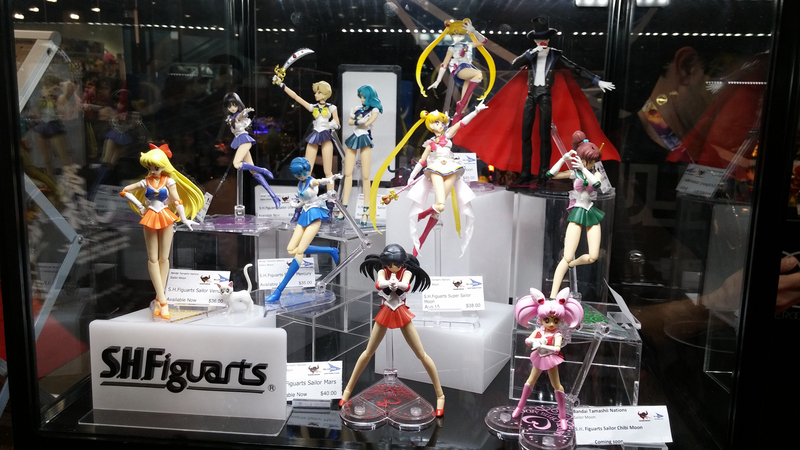 Sailor Moon SH Figuarts display! 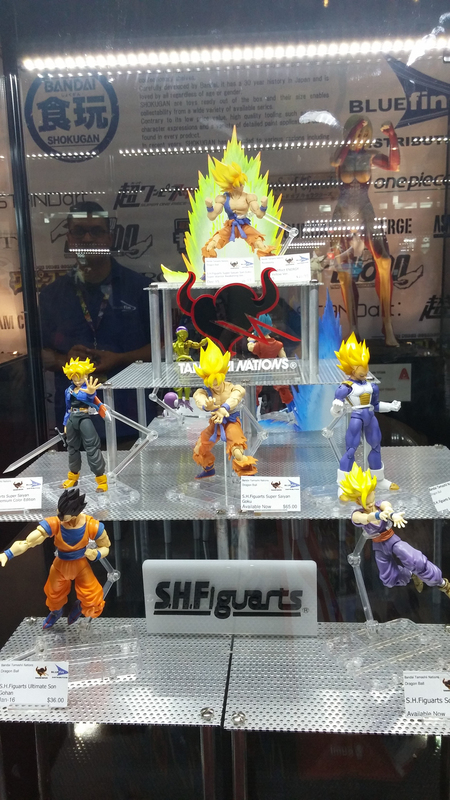 More DBZ SH Figuarts display! 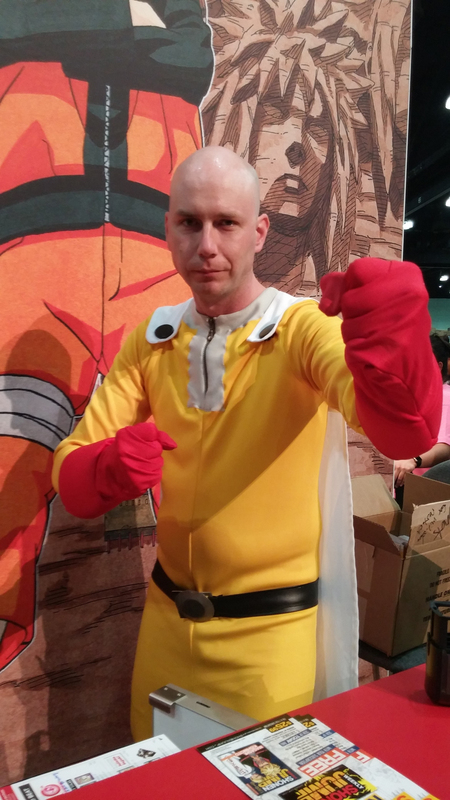 One-Punch Man’s Saitama at the Viz booth! The Viz booth was really into promoting One-Punch Man, which comes out in print on September! 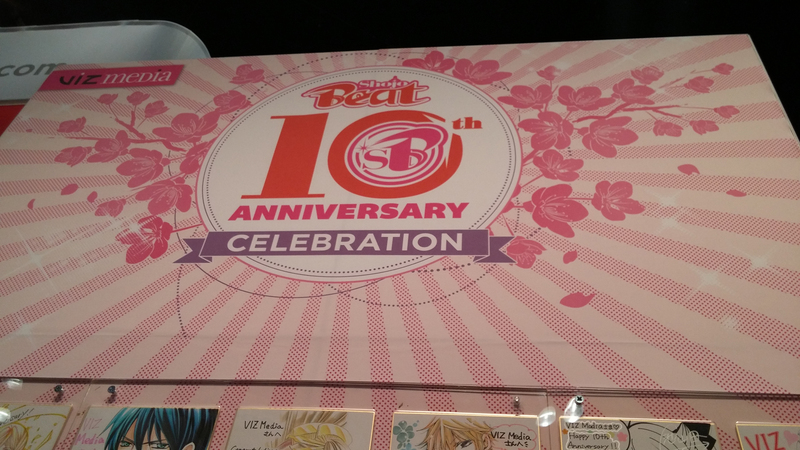 Shojo Beat’s 10th Anniversary display! 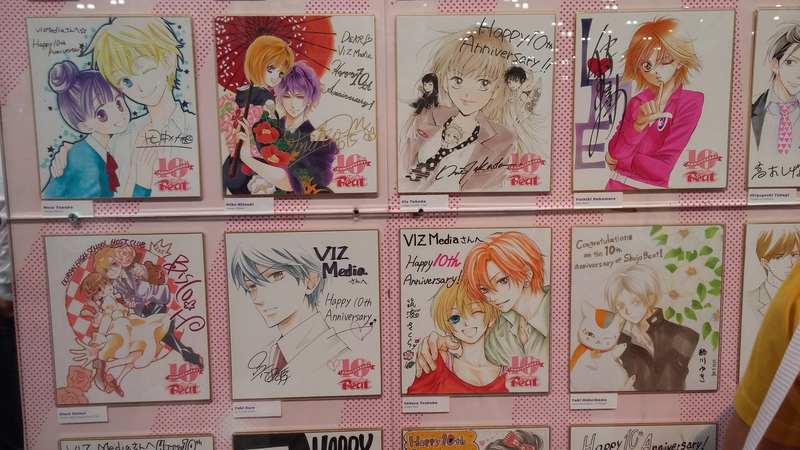 Viz also had this amazing display in celebration of Shojo Beat’s 10th anniversary! 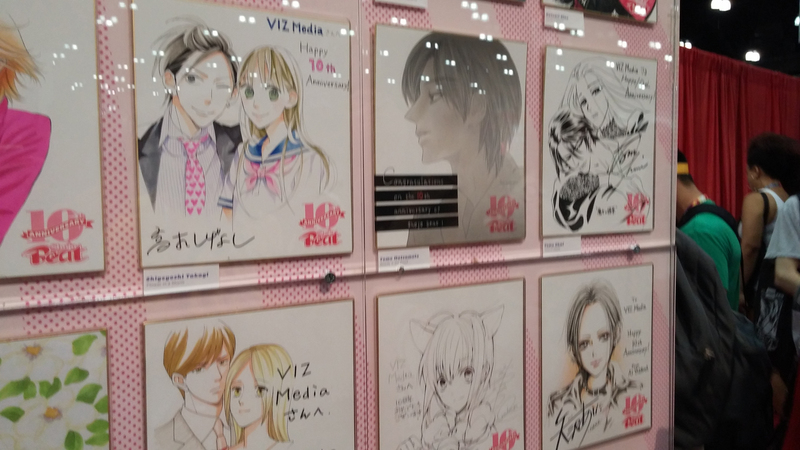 The display featured illustrated and signed boards from famous shoujo artists featured in Shojo Beat. I decided to make my way towards the Entertainment Hall, since I hadn’t been by there yet. It’s most commonly known as the “Game Room,” since there are tons of videogames set up ready for attendees to play. However, the area also has a cosplay set area, where different scenery sets are displayed for cosplayers to have photo sessions in. It also has a neat cosplay repair center for cosplayers to make use of. 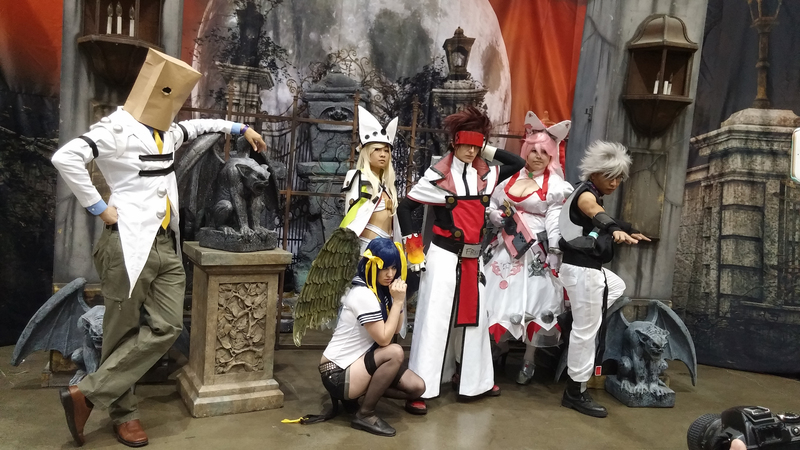 Guilty Gear cosplay group using one of the cosplay sets! 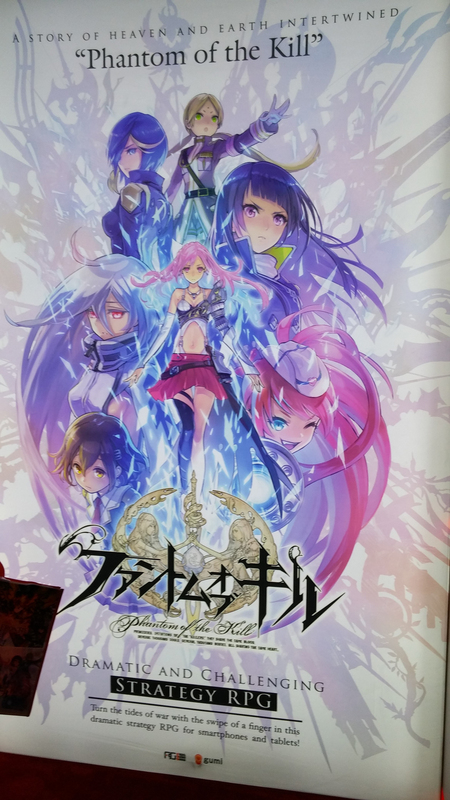 Idea Factory International was also in the Entertainment Hall, but only on Friday. 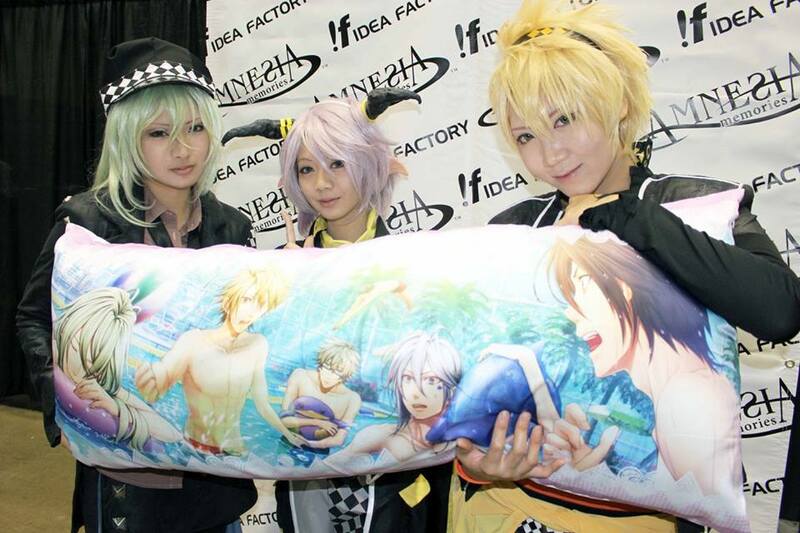 They were there to promote their latest game to be released soon, the famous otome game, Amnesia: Memories! The staff was really eager to interact with fans of the game, and they’re all ears for any feedback. 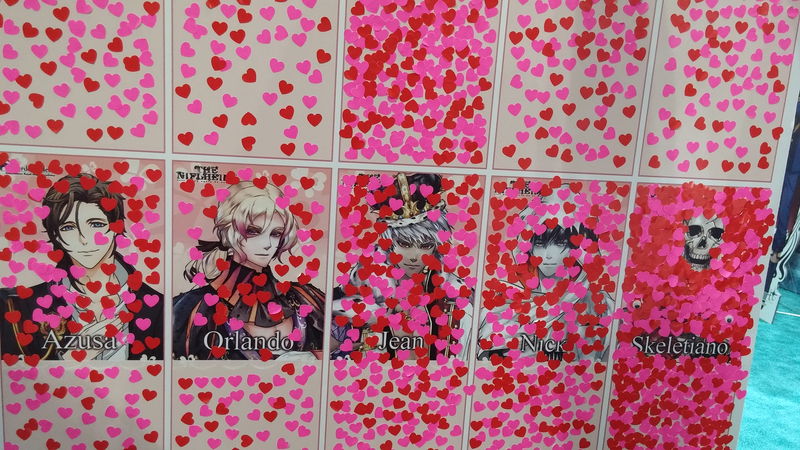 If the game does well, perhaps they will bring other many more otome games, so let’s support their effort! The Amnesia: Memories pillowcase that will be included in the LE set! Ukyo, Orion and Toma cosplayers! Photo credit: Idea Factory International on Facebook. 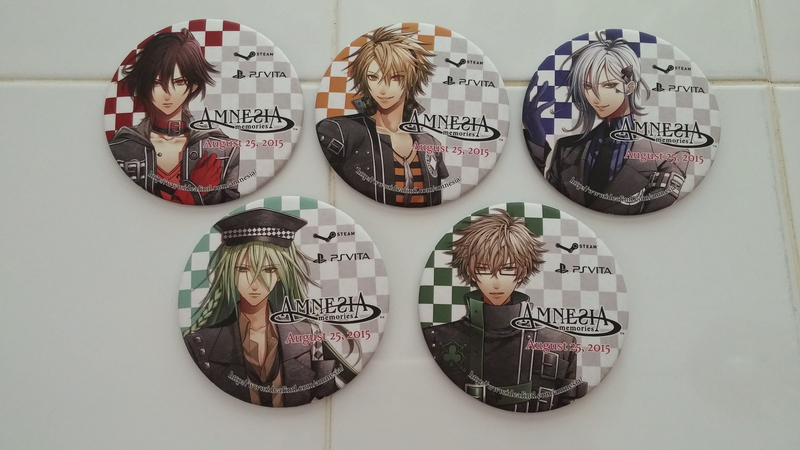 Pins of Shin, Toma, Ikki, Ukyo and Ken that attendees could choose from! When we got exhausted enough, we decided to head back and have a nice dinner to end our day. Didn’t do as much shopping as I did on the first day, but I picked up some good stuff! 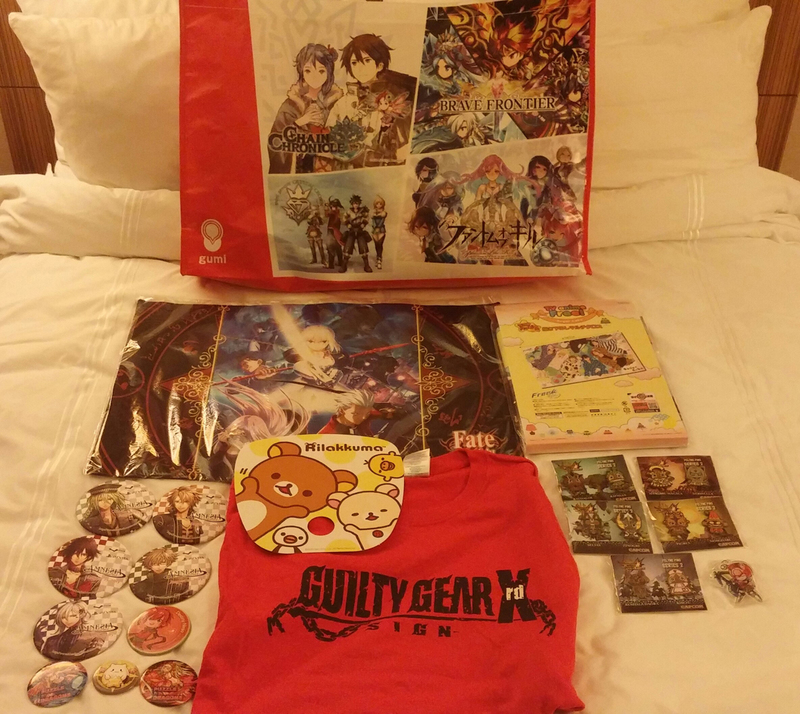 Revisited Capcom’s booth for the series 2 Felyne pins and the Poogie shirt, got Wagakki Band’s album, went to Aksys booth for the Guilty Gear Xrd shirt, along with other miscellaneous goodies from other vendors. 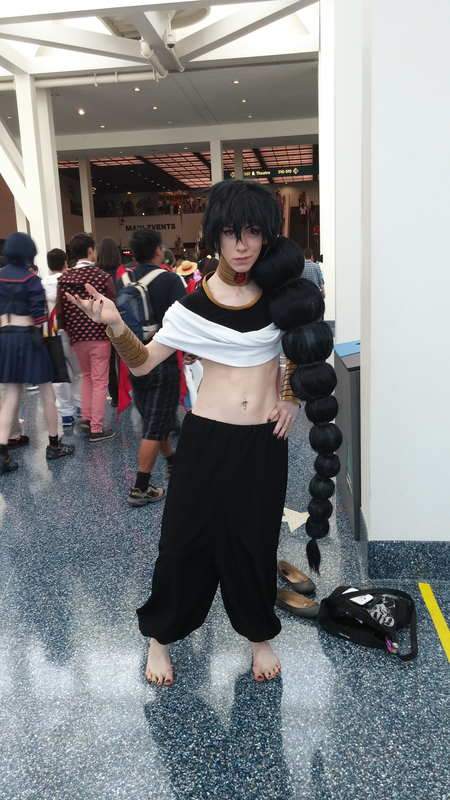 That’s it for the Anime Expo day 0 – day 2 convention report! 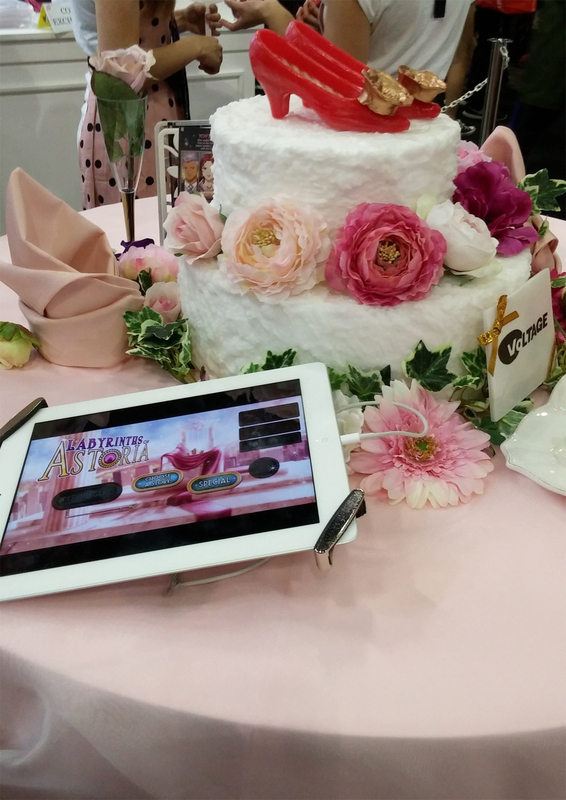 Hope you all enjoyed reading through it and looking at the various pictures of the event! 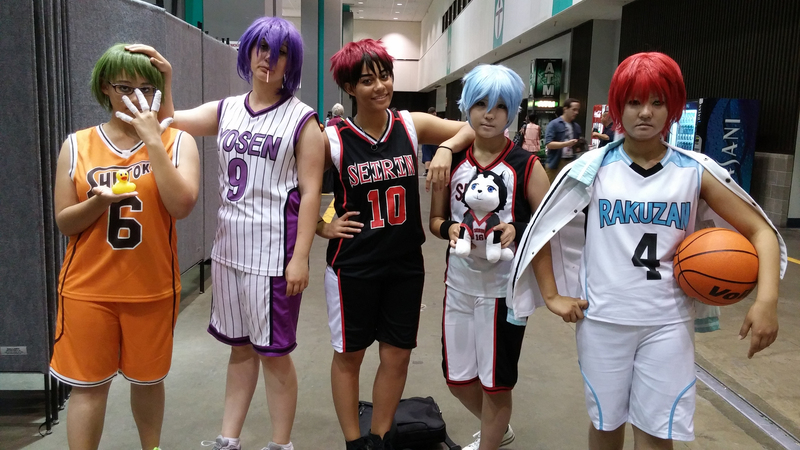 Kuroko no Basket cosplay group! 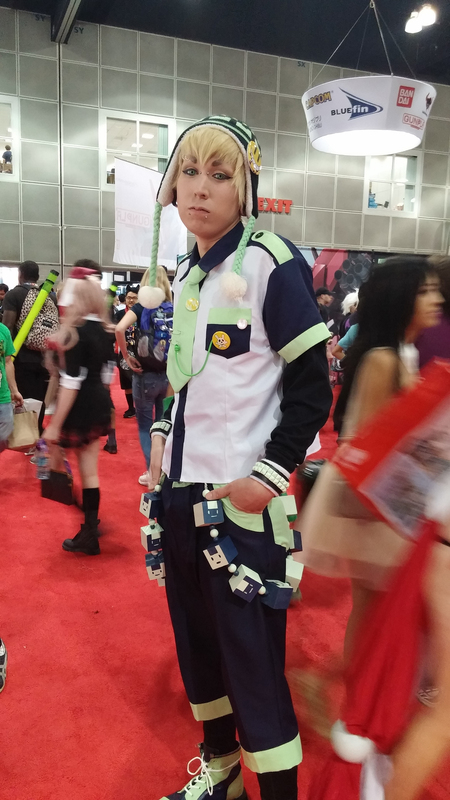 The best DRAMAtical Murder cosplay I saw! Noiz! Please look forward to the next part of the convention report! Until next time! ← The Sunshine Award Nomination!